In addition to saving money, you can also add a little breathing room to your budget by making a few bucks on the side, or even a full-time income if you really run with one of these unique ways to make money. Have you heard of Fiverr? Fiverr is the world’s leading marketplace for services such as graphic design, proofreading and editing, content creation, website optimization, and much more (there are over 100 categories and over 3 million services available). It’s free to become a member and only takes about 5 minutes to create your first “gig.” Sellers keep 80 percent of their profit, most often $4 of the $5 gigs are sold for, hence the name Fiverr. Do you have a fun quote or saying you’d love to see on a t-shirt? Think quite a few other people would love it too? Well whip up your very own t-shirt design to sell on TeeSpring! 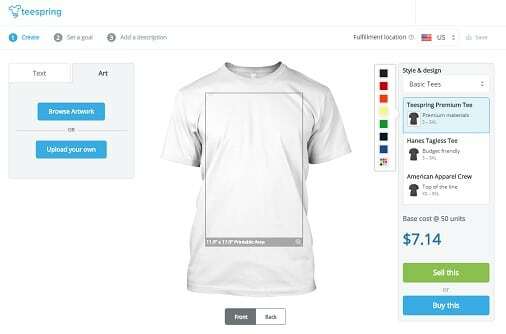 With Teespring it’s easy for anyone to create and sell high-quality products people love, with no cost or risk. You just design your shirt, set a price, add a goal, and start selling. Teespring will handle the rest – production, shipping, and customer service – and you keep the profit! Teespring University can help you get started and answer your questions. You can find advice and inspiration for successfully running your Etsy shop in the Seller Handbook. It’s a completely free, no strings attached site that rewards you for all of the things you’re already doing online. Searching the web, Watching Videos, Playing Games, Taking Surveys, Shopping and more – as you do these activities, you’ll earn points, called SB, which you can redeem for all sorts of gift cards in the Rewards Store. Choose the activities you like or have time for – how much you earn is up to you! Start racking up the points and gift cards now to take care of your Christmas shopping this year. I can’t tell you how many Amazon gift cards I’ve racked up over the years! National Consumer Panel – Join National Consumer Panel – Earn valuable points, which are redeemable for electronics, household items, jewelry, toy, gift cards, and more. Vindale Research – Get Paid to Review Products Join the finest minds in consumer research and change the world one product at a time. Share your unique opinion and get paid for it! Opinion Outpost – Take Surveys to give your opinion and shape the future. Rewards include get cash, Amazon gift cards, game points, donations to your favorite charities, and more. Toluna – Get rewarded for surveys and polls. Valued Opinions – Don’t give your opinions away get paid for them! Harris Poll – For every survey you successfully complete, you will receive points called HIpoints, which you will be able to exchange for awesome rewards after just doing a couple of surveys! Also, with every survey you complete you have a chance to enter our $10,000 sweepstakes! MySurvey – Have fun and get paid for taking surveys online. These are just a few of the many ways you can earn money on the side. Obviously running with one of these ideas will get you more than a few extra bucks…you can make a full-time income! « 10 DIY Pallet Decorating Ideas – Perfect for Your Home or as Gifts!